A family run vets offering a trusted, caring service for over 30 years. We are an independent, companion animal veterinary practice that was founded in 1982 by Chris and Pam Hanson. Claire Hanson and Adam Wraith are excited to have taken over the practice in April 2016 after having worked alongside Chris and Pam for over 10 years. 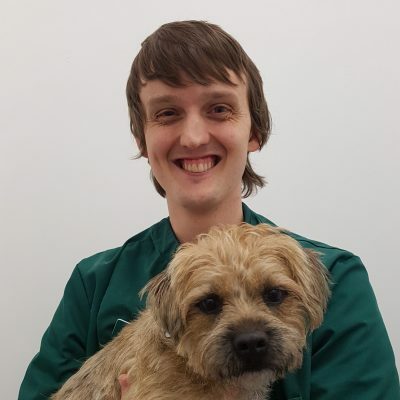 We are extremely proud to have achieved RCVS accreditation as a Tier 2 vet nurse training practice as we believe it aids in maintaining standards and progress and overall improves the service and advice we offer. We currently have a team of 5 nurses led by our head nurse Samantha Tomlinson who has been with the practice for over 20 years. With the complement of experience, continued professional development and approachability we hope to offer peace of mind and the best preventative healthcare for you and your pets. Click here to meet the team. 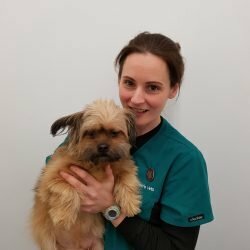 We are a family run veterinary surgery based in Altrincham, Cheshire committed to providing a trusted, personal service to our clients with the highest standard of professional healthcare for your pet. Introduced to Hansons by my mother in law, as they have always brought their animals here. They have always treated our pets like they were their own. 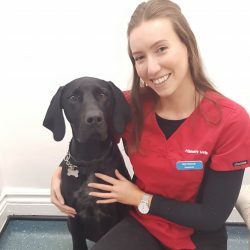 Claire graduated from London Veterinary School and enjoyed working with her father Chris Hanson for 10 years before taking over running the practice in 2016. She enjoys walking the family dog Szusy. She lives with her fiancee Simon and elderly cat Sundae, who was entrusted to her from a client who was relocating. Outside work she enjoys travel, reading, cooking and long walks with Szusy (the family Viszla) Claire also plays badminton, golf and netball in a league with friends. Adam graduated from The University of Nottingham and joined the team after previously working in Wigan. He had previously seen practice with us as a student. He lives locally with his partner, dog Ralph, cat Phoebe and gecko Yzma. His main interests out of work are playing hockey, watching football and enjoys swimming and scuba diving. Sam is the head nurse here at Hanson’s. 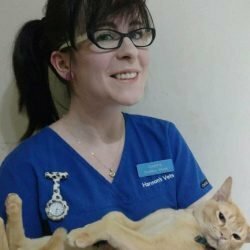 She has always had an interest in animals and has been a qualified RVN since 2001. Sam has a keen interest in surgical nursing and anaesthesia and in the future would like to train for an advanced diploma within this field. Sam is our practice clinical coach and is responsible for training our student nurses. In spare her spare time Sam enjoys playing netball, looking after and eventing her horse Wicket. 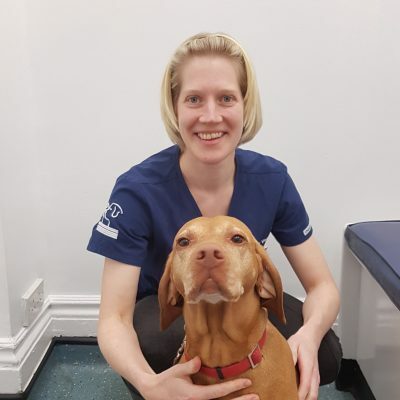 Sarah joined the practice in June 2013, she previously worked at the RSPCA Manchester Hospital. 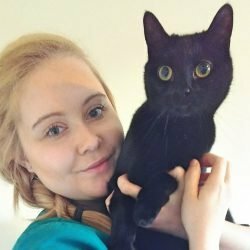 She gained a degree in Visual Communication from Leeds College of Art after 6th form before working in the veterinary field. She has 3 cats, Harold,Olive Oil and Tiggy, and two geckos called Maurice and Raul. In her spare time she produces pet portraits, some of these can be seen decorating the practice! Carris is one of our student nurses, she joined the practice in September 2013. Once qualified she would like to expand her knowledge in laboratory diagnostics and would also like to study nursing wildlife. She has 3 cats- Freda, Gimli and Penny. She also share the house with 3 dogs. In her spare time she enjoys walking, painting and reading. Her favourite things are a good cup of tea and cheese! 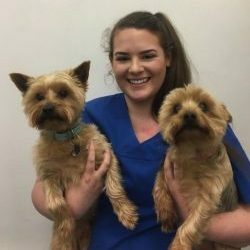 Katie joined the practice in October 2017 deciding a more hands on approach suited her better than accepting a place at university to train as a veterinary nurse. Katie had previously volunteered at Hanson’s one evening a week for the last year and also used to volunteer at the Society for Abandoned Animals. She is now studying towards becoming a veterinary nurse. Katie has two dogs, Rex and Lacey, and two fish, Shadow and Zippy! treating clients at the practice following orthopaedic surgery or as treatment for more chronic issues.